Published: Oct. 22, 2015 at 12:44 p.m.
HERTFORDSHIRE, England -- Few teams in the AFC have been as savagely bitten by the injury bug as the Buffalo Bills. Their bad luck in the health department was on display Thursday as coach Rex Ryan announced that both quarterback Tyrod Taylor and wideout Sammy Watkins won't be available Sunday against the Jacksonville Jaguars at Wembley Stadium. Somehow that wasn't even the biggest news of the day, as Rex said of receiver Percy Harvin, who didn't make the trip: "I don't know where he is right now." Where Harvin is, according to NFL Media Insider Ian Rapoport, is pondering his playing future due to a lingering hip injury -- stripping this offense of yet another playmaker. A Bills source also told Around The NFL's Conor Orr that retirement is certainly an option for the 27-year-old pass-catcher. Coordinator Greg Roman ran the league's most multiple, formation-rich attack in San Francisco, but told Around The NFL on Thursday that he can't do the same in Buffalo right now because of the frustrating swath of injuries that leaves backup EJ Manuel to face the Jaguars with Chris Hogan and Robert Woods as his top two wideouts. It's not the offense Buffalo planned for, but that's life in the NFL. Nobody on the Bills is complaining, but what looked like a nice opportunity to get to 4-3 now looms as a tougher task than anyone imagined. 1. Ryan opened his press conference with a plea to England's swelling NFL fan base, saying: "It just dawned on me that the fans here in London, they definitely should be cheering for the Bills. You know, they got the same colors, Union Jack and all that kind of stuff ... What do you want? Teal? What is Jacksonville? Teal? Come on. Please." 2. Manuel's underwhelming career to date is a frustration for Bills fans, but the 2013 first-round pick argued that his return to the starting role -- after many believed he could be cut this summer -- is a positive sign in growth. "I've earned everything. It's not like this was all given to me," Manuel said. "I had to earn my time to get back to this point." Players and coaches continue to express confidence in Manuel, but his game film reveals a signal-caller hampered by gaffes and inconsistency through the air. Stripping Taylor from this attack makes life easier for a Jaguars defense that will likely stack the box against running back LeSean McCoy and dare Manuel to beat them with a vastly depleted air attack. 3. Speaking of McCoy, Ryan has no regrets about the March trade that sent linebacker Kiko Alonso to the Eagles in exchange for the veteran running back, telling reporters: "If they offered that trade again, I'd do it." 4. As for Shady, he told scribes that his banged-up hammy "feels good," noting the biggest hurdle at this stage is simply trusting his legs and ignoring the fear of another injury. The Bills need a huge game from McCoy on Sunday to keep this offense afloat. 5. We'll have more from Roman on Friday, but the Bills play-caller told Around The NFL that one of the perks of coming to England was having his nine-year-old son Gregory make the trip with him. Roman's son had the chance to reunite with a former school friend from London named Dominique, who gave the Bills play-caller "his lucky Dr. Who pen," leaving Roman to reveal that he "drew up the game plan this week with my Dr. Who pen, so ... look out." 6. This is easily one of the strangest NFL practice fields we've ever seen -- in a good way. The Bills are staying an hour outside of London at The Grove, a swank hotel, spa and golf resort nestled in the peaceful woods. It was bizarre to watch Richie Incognito and his fellow behemoths bounce around this grassy clearing amid leafy trees, shrubbery sculptures and birdsong. The whole thing felt more like a dream than a football affair, but Buffalo's determination to stay alive in the AFC East is very, very real. Wake up and watch with the world. The NFL is live on Yahoo. For the first time ever the NFL is streaming a live game on Yahoo. 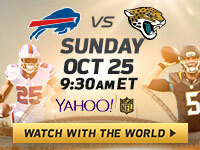 Bills vs. Jaguars live from London, Sunday, October 25th, at 9:30 a.m. ET.